is the biggest, baddest self-defense product to have in your arsenal for personal protection. Highly effective, painfully long and blisteringly hot. Your attacker will think twice next time. is one of the most iconic (and effective) self-defense products available for the average citizen. 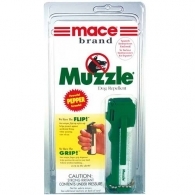 Also known as OC spray, defense sprays work by inflaming the mucous membranes in the skin, nose and eyes. Typical reactions include restricted breathing, coughing, choking, and tearing. The natural pepper solution is a real treat for the eyes, the main target area when neutralizing a threat. The peppers dilate the eyes upon impact, forcing the eyes to close involuntarily and causing an onset of temporary blindness for up to 15 minutes. The searing pain can last upwards of 45 minutes, allowing one plenty of time to get away and call the police. 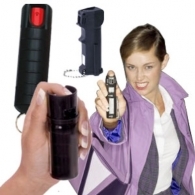 There are a variety of pepper spray dispersal patterns, all of which have their own advantages and disadvantages based on the circumstances and surrounding environment(s) in which they are used. This includes: stream, cone, fogger, gel and foam. Some pepper sprays only use OC (oleoresin capsicum) while others have an OC/CS (tear gas) mixture, which cause a subject to be affected by both the inflammatory effects of the OC and the stinging pain of the CS. Pepper spray comes in all shapes and sizes. They are as small as half an ounce and as large as one pound. Variations include regular canisters, as well as those with key rings and clips for belts. There are also concealed models in the form of lipstick, phone cases, bracelets, guns/firearms, and pens. All of these are great when dealing with an attacker, as it gives them no time to react. Overall, pepper spray is highly recommended for self-defense. It provides you with 8 - 25 feet of distance depending on the spray pattern, immobilizes an assailant up to 45 minutes, is easy to carry and provides a non-lethal alternative over carrying a firearm. 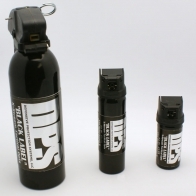 DPS Pepper Spray is by far the best brand of defense spray that we carry. 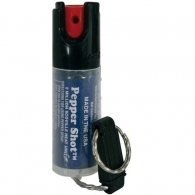 If you are on a budget, the DPS Pepper Spray – ¾ oz unit will serve you well. The volume or amount of spray you will have is low, but it is just enough to subdue an attacker. We recommend getting a 2oz can of the DPS X-Stream Range spray, since it provides plenty of shots. Finally, if you want the best of the best then the DPS Black Label is the way to go. The OC formulation on its own is deadly enough, but combined with 2% CS tear gas…its unstoppable. Prison inmates call it “ The Silver Bullet” for a reason. They won’t touch the stuff. NOTE: Be aware of the laws & restrictions for your area when looking for a pepper spray. Have questions? 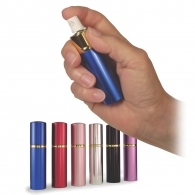 For in-depth information on this self-defense product, check out our pepper spray FAQ page.